I will admit that I was skeptical when I first saw the Silhouette Pick Me Up Tool, not really understanding how it would change or enhance my crafting life. I often work with tiny pieces — like scraps of paper and embellishments — and that is exactly what this tool is made for. So I tried it. When I first picked up the tool — which is shaped like a thick pen, so I will refer to it as a pen — I didn’t understand how it worked. There were no instructions on the package, and I found myself just staring at it. I could see a blue-ish substance inside one end, which was protected with a cap that was hard to get off. I tried twisting it, since the end in question clearly twisted into the body of the pen. That didn’t work, so I just pulled really hard and finally got the cap off. Now I could see that yes, the blue goo should be able to come out of that end, but it wasn’t. After a couple of days of staring at it and putting it back down, I noticed some printing on the side of it! Teeny, tiny printing! 1. Remove lid and twist top to expose sticky tack. 2. Twist the other way to stop the flow of sticky tack. 3. Peel off old sticky tack as needed. Caution: When you twist the cap to dispense the blue goo, be gentle! You can’t get it back in if too much comes out. The goo inside the pen is a sticky putty of some kind. I’m not sure what the goo is exactly, but it’s great and does indeed pick things up! All you need is a tiny dot on the end of the pen. I mostly use it on paper and cardstock, and I’ve tried it on various other materials too. I haven’t found any surface that it will not stick to, nor does it stick to anything permanently. It even works on shiny mirrored confetti. After I pick up the item, I usually capture it in my tweezers, gently pulling it off of the putty. If you are simply picking things up to move them or to put back in the container, you will need to use something to pull it off. You cannot just shake the pen for your item to fall off – it works too well for that! And this is where the plastic stylus from the other end of the pen comes in handy. You just gently pull the stylus out of the pen. 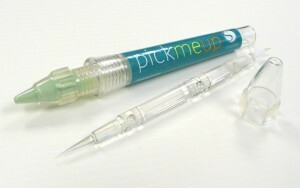 It has 2 different tips: one is pointed and one is like a flat screwdriver. Either tip will help you remove your item from the sticky putty. The stylus can also be useful on its own, to help poke stubborn paper bits out of intricate patterns *PIC*. #1 – Once you have used the blue putty goo for awhile, it will pick up dust and become less sticky. 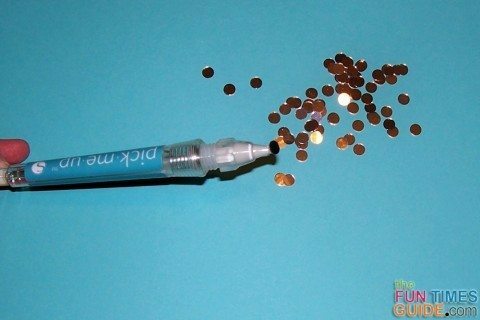 When that happens, just remove it from the end of the pen and gently twist out another small dot. #2 – There is a limit as to how heavy your item can be. For example, it won’t hold a whole 8.5 x 11 piece of cardstock paper. 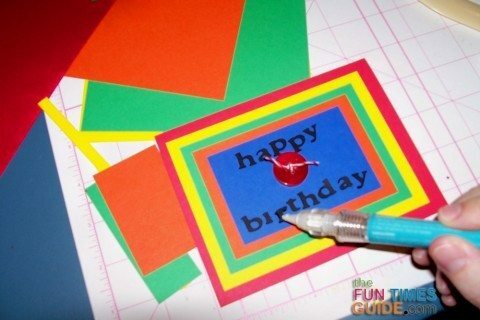 But for small crafts and all types of embellishments, it’s perfect!